You have the blessing of your parents living next door to provide childcare, but how do you deal with your mom’s chronic criticism? 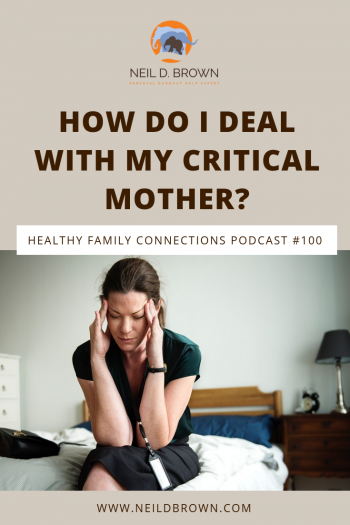 This is a very special podcast for me because it is the Healthy Family Connection's podcast number 100! If someone had told me a couple of years ago that I’d be producing a hundred podcasts with thousands of folks tuning in, you could have blown me over with a feather. But here we are and I’m thrilled! Thank you from the bottom of my heart! 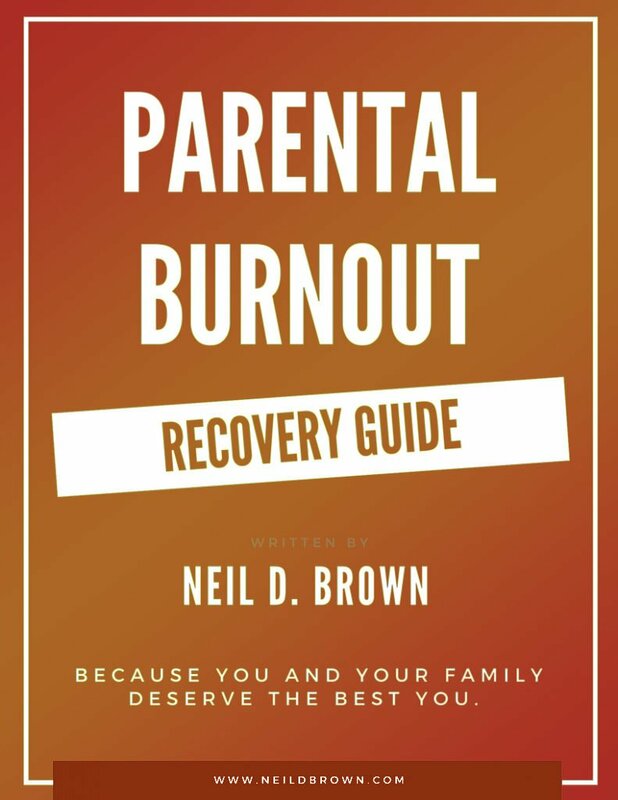 To celebrate, I’m having a draw to give away 5 copies of my book, Ending the Parent-Teen Control Battle. To enter, all you need to do is leave a brief review of the Healthy Family Connections Podcast on iTunes and then go to my website, neildbrown.com and send me an email telling me you did, and we’ll enter you in. Easy-peasy! The draw will be on April 10. Before we read the question today, I’d like to give a shout out to the global Youth Strike For Climate Action. Youth have the right to demand that we take action to protect the planet we’re leaving them. And just think, this was started by Greta Thunberg, a 16-year-old Swedish teenager. Let’s hear it for teens and young adults who empower themselves to change the world! My mother and stepfather live next door to us. This arrangement is so that my husband and I would have childcare as we both have demanding professional jobs. When the children were very young, it worked out reasonably well as my mother is good with young children. But now that they are 7 and 10, mom doesn’t set limits well and blames me for not teaching them to listen. Not only does she blame me for her inability to set limits, she constantly criticizes me in general. How I cook, dress, talk with my husband; she even has opinions about our friends. Sometimes I get angry with her and fight, but that accomplishes nothing and I feel even worse about myself than if I just took her criticisms and let it go. My husband is frustrated with me because I’m always upset with the situation and I feel like I can’t please anybody. I find myself crying after any problem these days. I feel stuck here and wonder if you have any ideas for me. Thanks for reaching out Mary. That is a heck of a dilemma. You bit the bullet and endured your mother’s chronic criticism for the support you needed. But now you’re not getting quality childcare support and you’re still enduring your mother’s chronic criticism, and related to all that, you have a husband upset with you as well. Before we look at some ways for you to deal with things, let’s take a look at some of the issues going on here. I love the fact that your kids have a close relationship with their grandparents. In our very mobile society, we often lose close extended family relationships and that’s a loss for our children, our parents, and for us. So it’s great that you have your mom and stepdad nearby. Now, it sure does sound like mom has a difficult personality, and related to that, your self-esteem has suffered. Ideally, we want to raise kids to understand themselves and accept and feel good about themselves. They should enjoy being who they are as they learn and grow. We want them to build their confidence and capacity for independence as they grow up. To accomplish all that, it takes parents who are committed to their children and feel good enough about themselves, so that they can offer feeling good about themselves to their children. In other words, you can’t give what you don’t have, so when parents don’t have self-esteem, it’s hard to give it to their children. Mary, it sounds like you got love and attention from your mom, but you didn’t get a mother who feels good enough about herself, to help you feel good about yourself. Undoubtedly, your mother grew up in a compromised environment that left her feeling unworthy. And her response to that is to externalize those feelings and rather than feel bad about herself all the time, she finds fault with others. And not surprisingly, her chronic fault-finding finds you. You’ve been dealing with it your whole life and it’s holding you back from feeling happy, successful and dare I say even joyful. I’m glad to hear that you have a challenging professional job; that tells me that you are talented and competent. And while you know that you can act talented and competent, on the inside I’d guess that you have a certain amount of doubt and maybe even feel like you’re faking it every day, that you aren’t really as competent and talented as you act. That self-doubt commonly comes along with chronic criticism. So Mary, we have our work cut out for us, but don’t despair; you can do this. First of all, you are in burnout. Managing work, your mother, your wonderful children and your wonderful husband without support, is too much. The fact that you find yourself crying a lot is not surprising. Where can you get some initial support, some initial self-care? Right now don’t try to solve anyone’s problems or try to change anyone’s behavior. Take a friend and get away for the weekend. Go someplace where they give massages or you can be in nature and take walks. You need support and you need some one-on-one time with yourself in a calm, natural setting. Doctor’s orders, that’s step one. Step two is a change in orientation towards your mother, children, and husband. We need a more empowered version of you. Right now, your orientation is to please others, make everything work, and do what it takes to make everyone happy. Even though we haven’t met, I’ll bet anything you’re a fabulous person. Your mother should be honored to have you as a daughter, your husband should be honored to have you to love and be loved by you, and your children are lucky to have you as their mother. No, you are not a perfect person but no one is. Yet you are plenty wonderful and your biggest downside is in trying to please rather than to simply be yourself. Set your limits where you need them, ask for what you need, have your own requirements of others, and give yourself permission to take quality care of yourself. In other words, Mary, you can no longer live with the legacy of your mother’s chronic criticism. Chronic criticism tells a child that no matter what they do, it isn’t enough; it isn’t good enough. I’m inviting you to outgrow that message and wear a new one, adopt a new narrative, upgrade your internal operating system. You need a new narrative or operating system that says, "I’m empowered and entitled to be myself, to set my limits, and be loved and supported by my intimates; loved and supported for who I am, not just for what I do." How does that sound? Now how are we going to put this new attitude into action? It’s not as hard as you think, but it means changing some pretty entrenched relationship patterns since your relationships are steeped in you trying to make others happy. Here are some tools for making that change and let’s start with your mother because your relationship with her is key to your sense of self and your narrative. So if you change your relationship with mom, you can change your relationship with everyone else more easily. The old you might say, “That’s the way kids act, mom. I can manage them when I’m there, but I can’t do anything when I’m at work,” for instance. Mary, what did we do here? We acknowledged mom’s experience, empathized, and we did not get defensive. Being defensive is what we do when we try to get the other person to not blame us. In your mother’s case, that’s never going to happen and being defensive in any case is rarely effective. We naturally respond with defense when we feel attacked or blamed, but all it ever does is engage an argument. Your goal is to never engage an argument with your mother, or for that matter, with your children or anyone. It’s always going to be more effective to acknowledge their thoughts and feelings, empathize, and then establish a boundary or offer a suggestion. Mary, give yourself permission to outgrow your need for approval and validation from your mother. She doesn’t do that. If she did, you’d have it already. It can be challenging to give yourself permission to be emotionally and socially more mature than our parents. After all, we grew up needing and seeking their approval. As I said earlier, if we get validation and support growing up, along with limits and guidance, of course, we’re primed to continue to learn and grow. We're primed to mature ourselves. But when the validation and support are missing, we need to come to that realization sometime in our adulthood and give ourselves permission to learn and grow all on our own. And that’s where you’re at Mary. I’ve focused this on your relationship with your mom, Mary, but we also have your 2 children and your husband to shift your relationship pattern with. Let’s not take all that on here but by changing your pattern of relating with your mom, you’ll be growing your new healthy narrative, your healthy empowered self. Now think about how you can bring that to your parenting and to your relationship with your husband. It’s time to change the negative pattern of those relationships as well. Mary, I strongly suggest you get yourself a first class therapist; someone who will not only listen and empathize, but will give you some actionable tools and strategies for taking better care of yourself and setting limits with confidence and grace. Remember, in celebration of my 100th podcast don’t delay entering the draw to win a copy of my book, Ending the Parent-Teen Control Battle. All you need to do is write a review of this podcast, Healthy Family Connections, on iTunes, and go to my website and email me to let me know you did it. That way I’ll have your name and email address and I’ll be able to enter you in the draw on April 10th. And please do remember to take care of yourselves. You need it, you deserve it, you’re worth it.